It’s not a fad – and these numbers show it’s here to stay. It’s an exciting time for veganism - and these stats prove it. Veganism no longer feels like a niche choice: plantbased living is becoming more visible. 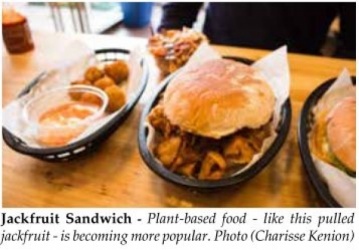 You can see this growth on social media, but also on the high street too, with more shops and restaurant-catering to a growing vegan audience. Here’s 10 key stats that prove veganism is only set to get bigger. 2. Google Trends shows massive 90 percent increase in ‘vegan’ searches The internet is the first stop for many when it comes to research, and data released by Google Trends shows a huge leap in the number of UK searches for ‘vegan’ between 2015 and 2016 (it’s too early to look at commensurate data for 2017). This spike follows a trend: 2015 showed a 32 per cent increase in searches from 2014 in the UK - and this upward trend is evident in the US and Australia too. Stats released at the end of 2016 showed an enormous jump in vegan foods sales in the UK according to online retailer ocado.com. 7. UK Retail giant Sainsbury’s doubles plant-milk offerings In a clear indication that customer demand is getting through to shop bosses, supermarket Sainsbury’s has doubled the number of dairy-free milks it offers, with a massive 300 stores starting to roll out dedi cated non-dairy bays with milks, yogurts and other drinks. In a bid to become ‘a real destination shop for customers looking to replace regular milk with non-dairy alternatives’, the shop has introduced lines from Califa Farms and Plenish as well as expanded its Alpro offering in these 300 stores. The new initiative follows category growth of 11.5 per cent in the store over the past year. It’s not easy to provide exact stats for how many vegans there are in the US, but there are a number of polls which have tried to do just that. The most expansive sampling of Americans – polling over 11,000 adults - suggests around 1.6 million people over 17 are currently opting to leave animal products off their plates and out of their lives. Veganuary – a charity which encourages people to try veganism for the month of January – was launched in 2014. In just a few short years, the impact this organization has made is amazing – and a testament to the growing interest in plant-based living. The initiative had 3,300 participants in its first year (2014), with 12,800 in 2015 and 23,000 in 2016. With organisers expecting to see this growth continue, 2018 could easily see over 100,000 people taking part.